This morning I drove about 30 minutes east of my home to the Iola Winter Sports Area for a 15km run on the snowless ski trails. The Winter Sports Area straddles a large undulating moraine and thus all ski trails are either going up the moraine or down the moraine. In addition to wide ski trail lanes the Winter Sports Area hides miles and miles of curvy single track for mountain bike riders. This morning’s run, hosted by Great Lakes Endurance events was a diabolical combination of wide ski trail climbs and severe descents and twisting single track that weaved around every tree larger than 12 dbh. In addition to my own individual race against the clock I was racing for a 1 pound round of local cheese. The top 3 finishers in each age group won the cheese. Thus throughout the race I was sizing up the competition in front of me and on my tail to determine if they were a threat to my quest for cheese. Despite a missed turn I arrived at the staging area in plenty of time. The best way to know if you are early for a race – no line for bib pick-up, no line for timing chip pick-up, and most importantly no line for the port-a-potty. Once checked into the event I finished my clothing prep, did a minimal amount of stretching, and did a bit of light jogging. I also hunkered down in my car when a sudden shower brought another soaking rain. It had rained on and off all night so I was expecting lots of wet grass and even some mud on the course. One of the big advantages of a trail run is a short warm-up jog can quickly lead you to a hidden spot in the woods for personal relief. The event was a combination 5k and 15k run. All runners were to start at 1000. The 5k course was marked with blue flags. The 15k course was marked with orange flags. The 15k runners were to run the 5k blue flag course and then run the remainder of the 15k course following the orange flags. We were instructed to always keep the flags on our right. 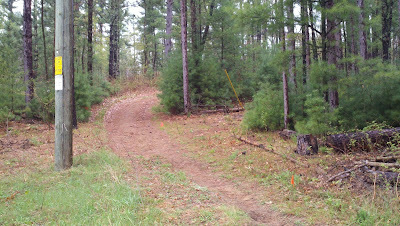 Just to keep things interesting sometime the orange course re-ran portions of the blue course and on at least two instances the orange course ran west on a trail that we later ran east on. Now the flags were on my right and left. Sigh …. At most races there is a group of lean, young males in high school or college track singlets toeing the start line. At this race the start line seemed to have a repelling effect as there wasn’t anyone within 3 feet of the start line when the gun went off. I was the closest, but in the first 100 meters a large number of runners burst past me. 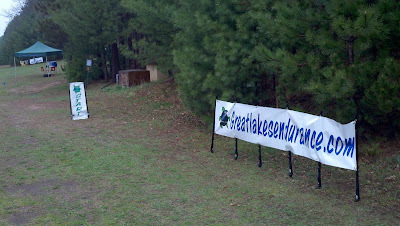 The start of the course was on the only flat stretch of ground in the entire park. After about a quarter mile we turned right to begin climbing the moraine and leaving the flat ground behind us. I immediately realized I was going to run 15k at a 6:30/mile pace so as we began the first climb I throttled back and tried to find a pace I could maintain on the ascents and allow myself to gear up on the descents. Congestion was minimal so I was able to run freely. We looped back around the lodge and climbed another ridge. On this climb I fell into a pace with a couple of other runners. I found they would pull away just a bit on the climbs and I would close the gap on the descents. The other challenge of the first 5k was not knowing which runners were 5k or 15k runners. I always prefer to have some sort of bib color designation to best understand the field around me. The surface was mostly sand either covered with wet grass, wet leaves, or wet pine needles. Of course there were sticks, tree roots, and rocks to navigate around. Also there were constant undulations in the surface. The only difficult footing I encountered was wet clumps of leaves. Fortunately I stayed upright the entire race and I didn’t see anyone fall. Note: I also did not hear any trees falls. The first 5k finished on the same straight and flat stretch we began. The 5k racers veered right to the finish line and the 15k runners took a sharp left back up the hill. As I climbed this short, but very short hill I walked and took a long drink of gatorade. Although there was a fluid station at the 5k and probably the 10k mark I only drank from the bottle I brought. The event organizers don’t supply cups and encourage everyone to bring their own bottle or hydration system. Because of the foliage and very curvy trail my Garmin GPS distance of the course was significantly different than the marked course. I am pretty sure the course was marked close to 15k (9.3 miles), but I ended up running, according to my GPS, only 8.89 miles. Not sure where that 0.4 was exactly but I am sure I ran it. The final 10k began by repeating part of the 5k course. All of the climbs I had done before I got to do again. I made a couple of passes early on and then settled into looking at 2 runners ahead of me that seemed to make the next turn just as I brought them into my sights. About 40 minutes (maybe more) into the race I could hear a runner catching me. On the uphills his breathing got closer. On the downhills I increased the gap. With him nearing, and potentially threatening my cheese, I kept pushing on the downhills. In one surge I caught both of the runners I had spied in front of me earlier. I now had three runners close behind me. We crested a small hill which had orange flags to the right and to the left. In a moment of confusion I veered left, violating the “keep the orange flags on your right rule”. Five steps into my veer left one of the other runners shouted that I missed the turn as he veered right. My CHEESE! I did a 180 and began my pursuit of the three that made the correct turn. I caught one of the runners almost immediately. He kindly stood to the side on a portion of single track to allow me by. On the next wide trail descent I caught the blue shirt runner. They quickly disappeared behind us as I focused on the runner in the maroon shirt. With some gray hair along his temples I figured he might be in the 40-49 age group with me and we were in a pitched battle for a pound of cheese. On every ascent he would gain a little. On every descent I would get most of it back. As we yo-yo’ed apart a woman in a gray shirt suddenly entered the mix. She was now between me and the maroon shirt man. I just couldn’t close the gap. Despite the agonizing humidity and race day heat (almost 65F) coupled with the bladder pressure from my waist pack I decided to pause to take a whiz at about the 59 minute mark. I was pretty sure I wasn’t going to catch the maroon shirt man and perhaps by relieving my bladder I could refocus and not get caught from behind. About 30 seconds later I was running again, but now in no man’s land. No one within sight ahead or behind. The orange course re-joined the blue course and I knew that the final half mile was going to be pretty flat so I decided to pour it to the coals and see what might happen. There was CHEESE at stake. Winding single track is tough terrain to make up time. Just as I would get up to speed the trail would u-turn, drop down a dip, or leap up a little ridge. At the 9 mile mark I glimpsed the man in the maroon shirt and the woman in the gray shirt. She was now ahead of him. I had hope. Maybe he was faltering. I took it up one more notch hoping I might catch him in the final quarter mile. The gap was closing, but not as fast as I was running out of race course. Like finely grated parmesean through my fingers the maroon shirt man crossed the finish line 7 seconds (a fairly large gap) ahead of me. Should I have stopped to pee? Did the short recovery I got while standing for 30 seconds give me the boost I needed to close the gap. I will never know. Later in the afternoon I was able to confirm what I already knew in my heart. I was 4th place in my age group and missed a 1 pound block of cheese, age group finisher prize, by just 7 seconds. 7 SECONDS! I admit I have a very distinctive running style that probably could use some work. Will it yield me a faster time? Stay tuned. I am up to the challenge. Whatever it takes to win some cheese in 2013. An age group winner posted a twitter picture of his pound of cheese. Jealous.